Lets give you the stars in the sky scenery just under the blue sky. Meet where the stars kiss the earth. 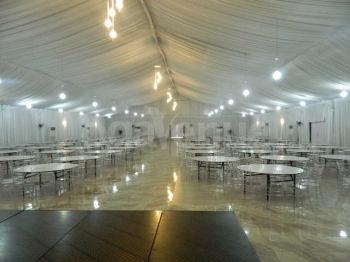 For that touch, book Rosetree Events Centre, a marquee close to the stars that brighten up your day. Have the entire spotlight beam on you and give every detail of your feelings to your guest. Out of this world chairs and tables that leave you blown. Theres nowhere that captures the passion of your story like Rosetree Event Centre. It seats 1000 persons in banquet style and 2000 in theatre setting. To accompany your stars in the skies are exquisite facilities such as a unique changing room, spacious parking space, lighting, projector, well-structured stage, fans, 24 hour power supply and maximum reliable security. You really don't want to miss out on giving your event the best stories to be told. 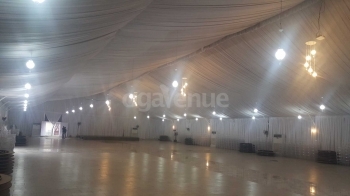 Types of events you can host at Rosetree Events Centre are Wedding reception, Marital vows, Seminars, Religious activities, Meetings, Trade shows, Dinners, Press conference, Networking events, Birthdays, Anniversaries, Music concert, Gala Night amongst others. Q: What type of chairs does Rosetree Event Centre provide? 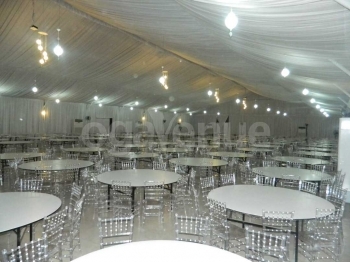 Q: What type of tables does Rosetree Event Centre Provide? Q: Is there parking space at Rosetree Event Centre? Q: Does Rosetree Event Centre provide power? Q: Does Rosetree Event Centre have Changing room? Q: Does Rosetree Event Centre provide security? Q: Does Rosetree Event Centre allow you bring in your food and drink? Q: Does Rosetree Event Centre have Chandelier? Q: Does Rosetree Event Centre have Drappings? Q: Does Rosetree Event Centre have a stage? Q: Does Rosetree Event Centre allow external Decorator? Q: Does Rosetree Event Centre have Restrooms? Q: What type of flooring does Rosetree Event Centre have? There are no reviews for Rosetree Event Centre yet. Sorry, not available at Rosetree Event Centre. Kindly check out other available dates or check out other venues in Victoria Island that match your requirements.